He broke 80 world records, won 8 world titles, brought home 2 gold medals from the Olympics and got his image on the cover of every somehow significant magazine in the world. 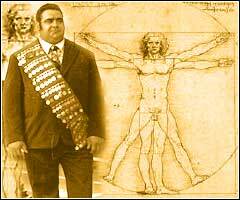 Vasily ALEXEEV is a true legend not only of Olympic weightlifting but of all sports. Like any legend, his name is surrounded with mystery. No one knows how he trained. No one knows his personal best results in training. No one knows how much he was getting paid for his world records. No one knows for sure when he was serious or joking. Does anyone know if Vasily was left-handed or right-handed? Without being sure whether we are serious or joking, the Lift Up conducted a super study on this subject matter. Unable to contact the Olympic weightlifting legend at the time of the study, the Lift Up presents a quick visual presentation featuring Vasily Alexeev in the sports and in the non-sports activites (see below). Note: Please scroll to the right. As noted above, Lift Up is not sure about the validity and seriousness of this study. Unable to draw any conclusions, we ask our visitors if anyone knows if Alexeev was left handed or right handed. Please don't let another mystery cover the legend, email us or leave a feedback to reveal the truth.